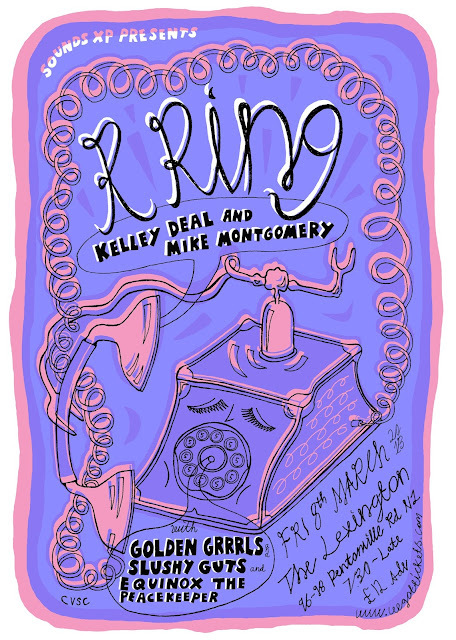 Poster I've just finished for Kelley Deals new band R Ring. Very pleased to be supporting them (as Slushy Guts, if you didn't know) along with Golden Grrrls and Equinox the Peacekeeper, next year in London. This will be screenprinted and available at the show. My colour adviser (who tells me I am colour blind) informed me that the colours make it look like the inside of an 80s ladies toilet. Of course I took this as a compliment and kept it exactly the way it is.